When is cheap debt expensive? Dave Ramsey says to use Gazelle Intensity to pay down all debt, before even thinking about investing. Yet, would he consider running his (rather large) business without an overdraft, or leased cars, equipment, and/or furniture? So, why should personal finance be any different?! But, Dave Ramsey would argue to pay off all debt, whether it is ‘good’ (e.g. produces income) or ‘bad’ (e.g. credit card loans for consumer goods, like that LCD TV that you just bought). Once the debt is incurred, it is no longer ‘good’ or ‘bad’ … it becomes either ‘cheap’ or ‘expensive’. You should only pay off your ‘expensive’ debt! What makes a debt ‘cheap’ or ‘expensive’? What is the yardstick interest rate? 2%? 5%? 11%? 19%? – Debt only becomes ‘cheap’ when you have something that produces a better after-tax return [AJC: probably, a MUCH better return to account for the fact that paying off the debt is a GUARANTEED return]. – Otherwise, by default, all debt becomes ‘expensive’ and you should do as Dave Ramsey suggests. 3. Convinced are needed in order to achieve your Required Annual Compound Growth Rate to reach your Number. I graduated college 2008 from the University of Texas. worked at an oil and gas company in Houston named Flour Daniels. they had massive lay offs in 2009. I worked for a year and managed to save well over 50% of my pay. I reinvested it all into the stock market. I set up a regular investment account and a Roth IRA. I have had no prior experience with investing/trading. I played safer stocks/ETFs .. Bought on dips and sold when it would pop. Oh and I also took out a loan from Citi bank.. who sent me a 10,000 loan offer in the mail with a 2% interest for the life of the loan. LOL.. I had to take it. I threw that into stocks also. Any how my point is. If i had focused on paying off my $28,000 college debt I would have missed all of last year gains. I just made it a goal to beat my debt interest. and I did! Currently I have enough money to pay off all my debt. but of course i’m not going to do it. I took out 2K from my portfolio to invest in an online woman’s clothing site. We have great style at affordable prices. we are not making huge profits.. but we are selling and that is encouraging. 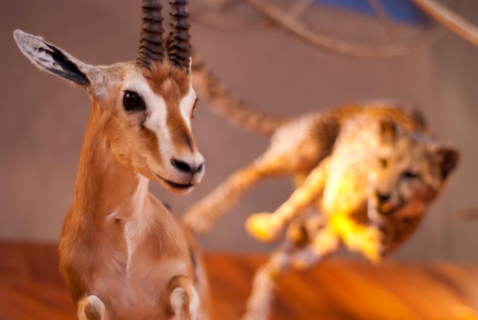 Did you notice in the image (above) why the gazelle has such intensity? This entry was posted in Starting Out and tagged 7million7years, debt, debt avalanche, debt snowball, Investing, money, Rich, Starting Out, wealth by Adrian. Bookmark the permalink. Borrowing to invest implies leverage. Is that really the best option? I guess it depends on what you’re investing for. If it’s for retirement I personally don’t follow that methodology. Your cheetah strategy relied on the chap getting out before it popped and then getting his loan before a massive surge. What about the guy who say leveraged himself in mid June 2007. He’d be hurting today and his real wealth would be a lot further down than the 22% of the S&P 500 from its peak. I agree that leverage has its place but I certainly don’t use it for my long term investing strategy. There are more costs to consider than just investment opportunity cost. That said, you also need to have juicy investment opportunities that look more attractive than paying off debt. Nothing really excites me right now. So I am paying off variable interest debt 1st (HELOC I used to avoid a jumbo loan). I know Bernanke is going to pull the trigger soon, and I don’t want to be exposed. Paying down debt is guaranteed 100% to “return” you whatever the interest rate is. Investing can be more risky. Psychologically there is a much larger gap between 99% certainty and 100% certainty than say 40% and 41% (even though they are equivalent). This makes it hard for those of us who haven’t taken many investment risks to see the errors of our ways. If I have a choice of (A) 100% probability of a 5% return or (B) a 25% chance of a 400% percent return with an 80% chance of a 100% loss, which one is the better option? — mathematics (economics) and psychology (behaviour) don’t always agree. The other part of the problem is how many times you get a kick at the cat if things go bad? What would happen if you were 30G’s in debt and started a business that failed, for example, would you be able to try and try again? What are the real chances of finding your number? Maybe my number is 0 and I just don’t know it. I would lock in my debt at current low interest rates, and keep my ‘war chest’ to pick up distressed assets going cheap as those who have overcommitted can no longer afford to hold on. With shares the risk of a margin call is very real and if you get one it will usually arrive at a time when a fall in share prices would suggest that buying more is a much better use of funds than meeting the margin call. In some countries you also have the pooling risk with margin loans depending on who you borrow from. IMHO, these risks put share margin finance in the “expensive” category – regardless of the actual interest rate. With property it is very unlikely (absent default) that the loan would ever be called early. Exactly, it’s all about the opportunity costs. However, I think sometimes people underestimate the costs of debt and overestimate the returns they will get by investing instead. If you truly do have cheap debt, it can be ok to postpone paying it off; however, if you have a variable rate mortgage then although it “appears” cheap now, it is not truly cheap; at some point the rates will go up and since you pay interest on the entire principal, your costs will go up significantly. In that case you have to consider the opportunity cost on the future interest rate instead of today’s interest rate. @ Kevin – In the US fixed rates are so easy to get (student loans, housing loans, etc.) that these are really the ones to leverage [pardon the pun]. I agree that you need to be careful in a variable rate market; having said that, if you were prepared to take out a variable rate business loan at, say 9%, how are you worse off by retaining a variable rate housing loan that runs at, say, 5.5% – presumably, if one goes up, both will? @ RetirementInvestingToday – couldn’t you just use ‘John’ … less typing 🙂 – not so, there is no market timing here … we’re just playing interest-rate spread; just like the bank. All the usual points to consider when buying / leveraging investments apply: Caveat Emptor / Buyer Beware! Not commenting on the post itself, but Dave Ramsey (claims to) runs his business with zero debt. Obviously it’s a private organization so we could never KNOW, but he has stated repeatedly that he has not borrowed a single penny since his bankruptcy, including for his business. Nobody in his company has a company credit card or lease. He purchases used cars and has debit cards given to his senior staff. Just saying. @ Jim – no great feat, if your business requires little capital expenditure and/or working capital for growth.